The Denver Broncos will look to cap an outstanding first half to their 2014 NFL regular season when they visit Gillette Stadium in a Week 9 matchup with the New England Patriots. The 6-1-0 Broncos travel east riding high currently on a four-game winning streak, SU and ATS, during which they have dominated opponents, easily covering increasingly wide point spreads by double-digit margins. Once again, the Broncos have been led by MVP quarterback Peyton Manning. The living legend and future hall-of-famer has been nothing short of spectacular during the Broncos’ current hot streak, throwing an astounding 14 TD passes against just two interceptions, raising his season total to a league-best 22, alongside his heir in Indianapolis, the Colts’ Andrew Luck. Not surprisingly, Denver’s strong play has cemented their position as Super Bowl favorites, with odds of 5/2 in NFL online betting at sportsbooks available through bettingsports.com. The Broncos’ meeting with the Patriots also rekindles the rivalry between Manning and New England QB Tom Brady, who together are considered the best two quarterbacks of their generation. Brady has led the Patriots back into strong mid-season form following a miserable start. New England dropped two of their first decisions including a shocking collapse in a 33-20 upset loss to Miami in Week 1 and an embarrassing 41-14 loss to Kansas City on Monday Night Football in Week 4, which left many fans and pundits wondering whether they were watching Brady’s imminent demise. The 37 year-old veteran pivot, bolstered by a suddenly revitalized defense, immediately reversed the Patriots’ fortunes following the loss to the Chiefs, spearheading the Pats’ current 4-0 run, 3-1 ATS, during which Brady has also thrown 14 TD passes while averaging 317 passing yards per game. New England’s meeting with the Broncos, in which they are early three-point home underdogs, is the 16th between Brady and Manning dating back to 2001, and the first since the Broncos dominated in 26-16 win in last season’s AFC Championship Game. 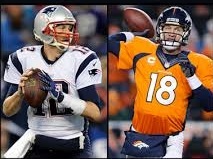 Brady holds the edge overall with 10 wins in the previous 15 games in which he has faced Manning, both as a Bronco and in Manning’s 13 seasons with Indianapolis. The Patriots have emerged victorious in four of their last six meetings with Manning-led teams, including their last three contests at Gillette Stadium. But with the memory of last season’s playoff clash fresh in the minds of both pivots, and top spot in the AFC overall standings on the line, the Week 9 battle between the Broncos and Patriots promises to be a must-see game and one of the highlights of the NFL regular season.